I’d not watched the Time video Behind the Photo in which LIFE picture editor John G. Morris talks through what happened when Capa’s 4 cassettes of 35mm film arrived at the offices in London’s Dean Street. Parts of A D Coleman‘s series of posts were based on the ‘ruined negatives’ that are displayed in that video as Morris talks. I’d not looked at the ‘ruined negatives (stills of which which were reproduced in Coleman’s articles) closely, but photographer Rob McElroy did, and he noticed something very strange. What are presented as contact prints from the ruined negatives are clearly identical to the good negatives except that the image area has been whited out and the frame numbers removed. Simply a rather poor piece of Photoshop. Given that they have identical scratches and marks there can be no doubt that this is a crude forgery, and represents a clear attempt to deceive the viewer. You can read McElroy’s guest post on Photocritic International and the images in it are absolutely convincing. There was ‘nothing’ on the first three rolls. In other words they were just clear film. Greatly underexposed. Nothing to melt, nothing to be lost in the drying cabinet. Capa had underexposed the film that he took before the actual landing so badly that nothing was recorded. The contact prints from the actual negatives would have been black and not white. And of course the totally blank films were thrown away. When Capa stood on the landing craft watching the soldiers making their way to the beach that there was enough light to record on the film, and when he was on the beach. Those were the frames that could be printed – and the only frames that he took of the actual landing. In Part 8 of his series, Coleman accuses Adrian Kelterborn of Magnum Photos, in collusion with Cynthia Young of the International Center of Photography and Mia Tramz of TIME of deliberately concocting a fraud in “blatant violation of professional ethics in the field of photojournalism, as articulated in the Code of Ethics of the National Press Photographers Association (NPPA)” and he posts a copy of his letter of complaint to Sean D. Elliott of the NPPA’s Ethics Committee urging an investigation of the matter. And as he says, surely John Morris must have seen and approved the final version of the video and thus share responsibility for the deception. FE – Further Education – has always been a neglected area. It’s something that hasn’t been helped by the Cinderella complex that has had many of the larger and more successful colleges jumping to grab the glass slipper and aloughing off their lower level courses to become part of Higher Education. Vocational education has always been looked down on in the UK, sneered at by the Oxbridge elite who dominate our culture and politics. Of course its a class thing – but what isn’t in Britain. Behind the specifics of the fight at Lambeth is the drive to convert public education to private profit, and this particular sector – if the Conservatives and their rich friends who own the companies trying to take over education get their way – will be the first to go. I arrived at Clapham Common where the march was gathering a little early and had time to take a little walk around. It was a little sad to see that one particular area that I’d photographed nearby was no longer there, a small street of houses replaced by a rather dull block. Clapham has been going upmarket for many years now, and this was just a small part of the old area. I was saddened but not surprised. There wasn’t a great deal happening when I returned to Clapham Common, and the lighting was tricky, with areas of shade under the trees along with bright sun. There was an ‘open mike’ with anyone who wanted to invited to speak, and I photographed quite a few of them, but it didn’t make for exciting images, though there were some banners to liven up the background. Things got a lot more interesting when people were told to pick up their banners and form up for the march, but things happened rather quickly and in a very small area, so it wasn’t easy to be in the right place. Once the march was on the street, things were a little easier, and the many banners made the march much more visible as well as giving me something to photograph. I rather like to keep my feet on the ground these days as I no longer have any head for heights at all, but I decided to clamber (with some difficulty) onto a barrier by some traffic lights for a few pictures, though some of the marchers as well as myself were rather worried about my safety! 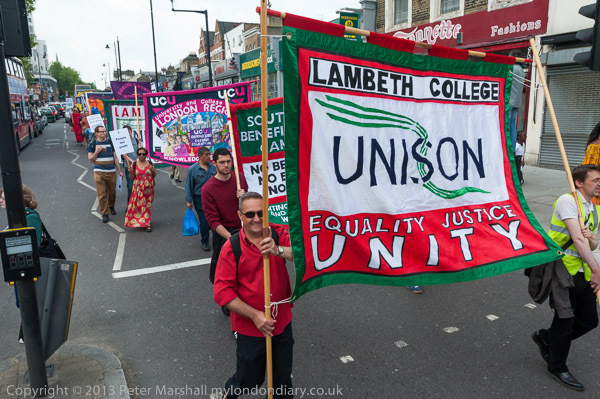 I particularly wanted a good view of the Lambeth College Unison banner at the front of the march, just behind the rather less attractive Lambeth College UCU banner (which of course features in some other pictures), and the extra height helped with this. One of London’s notable landmarks that the march went past was the mosaic at Stockwell tube station, to Jean Charles de Menezes, murdered catching a train here by blundering police in 2005. Of course I’ve photographed it before, but I walked over to take another picture. Later as the march came into Brixton, I went across the road to photograph the tree outside Brixton Police station, with its pictures and momentos of some of those killed by police there, including Ricky Bishop and Sean Rigg. It’s a part of the context of this march and the area the college serves. And I was particularly keen to that my pictures would show some of central Brixton, with its railway bridge across the High Street and the Underground station and shops. Using a bus as a speaker’s platform obviously makes sense with large crowds, but this was not a particularly large crowd, though at least it meant that most of the banners stayed up for the rally. But it isn’t ideal for photography. If you work on the top of the bus with the speakers you are at best seeing them in profile or from behind, seldom ideal positions. From the ground, close to the bus the view up is too distorting, and you have to move back and use a very long lens, and some speakers who are fairly short stand so they are almost completely invisible. Fortunately I’d put the 70-300mm in my camera bag that morning. It isn’t a huge weight, but I still don’t carry it unless I think it will be necessary. I always prefer to work as close as possible, and for most purposes the 28-105mm DX lens – equivalent at its long end to a 157mm – is longer than I need. But on this occasion it would be definitely underpowered. Most of the pictures are at 300mm, when the lens loses a little of its edge, and I would perhaps have got crisper images by taking them in DX mode at 200mm. I didn’t really need the full 7360 x 4912 pixels of the D800E. It might also have helped to use a wider aperture; as usual I was saving thinking by using program mode, and Nikon tend to stop lenses down rather more than I would. 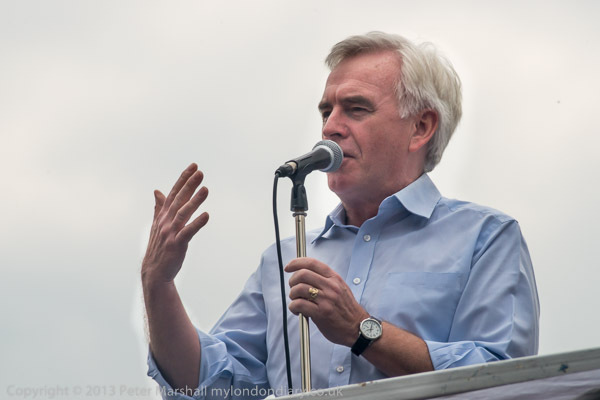 The picture of John McDonnell was taken at 1/1000 f16 (ISO 640) and if I had been thinking I would probably have worked at f8 to avoid the softening effects of diffraction. The solution is very simple – with a turn of the thumb-wheel you engage program shift, but you have to think to do it. It was probably also a stop or two underexposed with the pattern metering being a little confused by all the bright sky, but this wasn’t a problem. 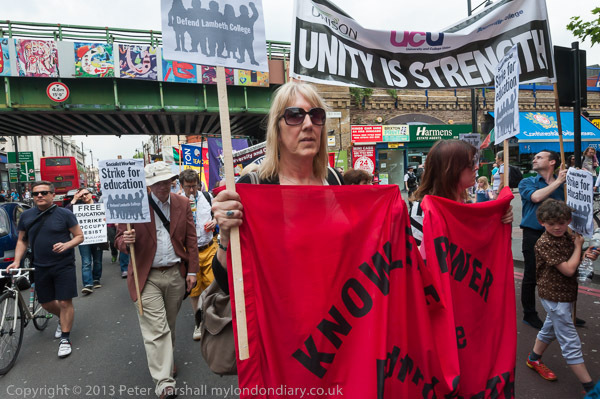 You can see more of the pictures at Lambeth College March for Further Education. 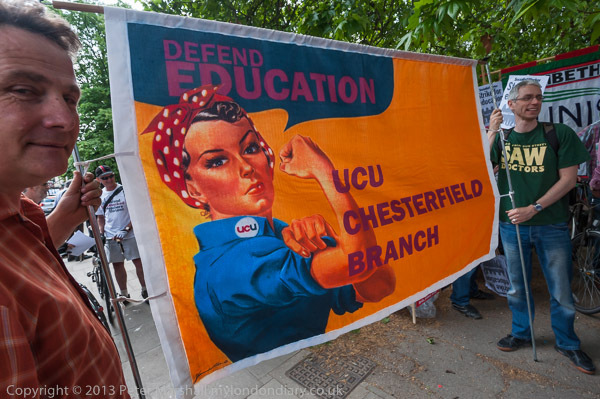 UCU members there have been on strike since 3 June and Unison members joined them in a three-day strike last week; there were solidarity protests at many colleges around the country last Wednesday. And now there is a Sponsor a striker campaign. But there has been an almost total news blackout by newspapers and broadcast media outside of the fringe socialist press. Too many biting footballers or right wing politicians scratching their noses for a strike to be news. Next you’ll expect the BBC to report a protest. The University of London’s Bloomsbury Garden Halls of Residence – Hughes Parry, Canterbury and Commonwealth Halls – occupy quite a large block on one side of Cartwright Gardens, in a conservation area a little south and west of St Pancras Station. They are fairly banal 20th century buildings that currently provide accommodation for around a thousand students and UoL have decided to renovate them to provide accommodation for another 200 or so. Much of the work will be financed by a private company, the University Partnerships Programme, which will then run the new hall of residence and presumably charge increased fees to get their money back. But the work will take around two years (part may be complete after one year) during which the halls will be closed. 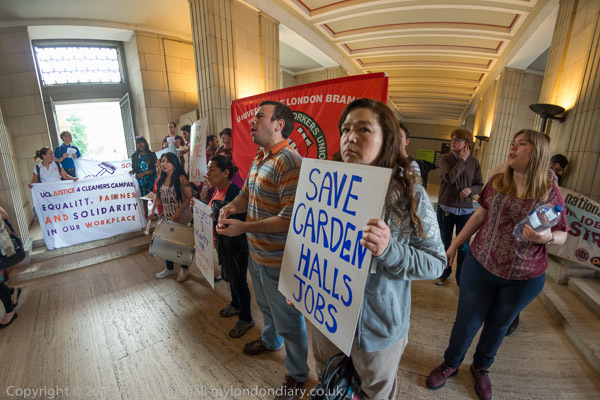 Around a hundred staff keep the halls running – cleaners, porters, catering and security staff – and they are to be made redundant by the contract companies that employ them, Cofely and Aramark. 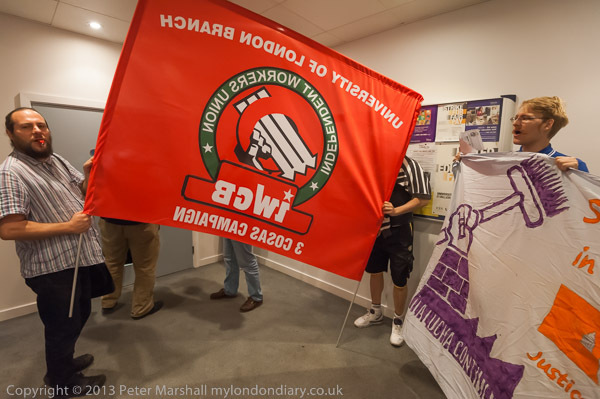 Most of the workers belong to the International Workers Union,the IWGB but the employing companies refuse to recognise or negotiate with the union. A curious defect of the law relating to trade unions allows employers to recognise unions that have few if any employees, while ignoring those the workers belong to. And that recognised union has failed to do anything for the workers concerned. Working in the space where the protest started has a few photographic problems. Firstly that during daylight, the area is quite a lot darker than the views of the outside, but there is nothing that can be done sensibly about this – you just have to let them burn out. But I also get considerable flare with people who are standing in front of these very bright areas, which needs a little treatment in Lightroom. I use an ‘adjustment brush’ with settings Contrast 22, Highlights -22, Clarity 32 and vary the values of Exposure to match the situation, and it usually helps. 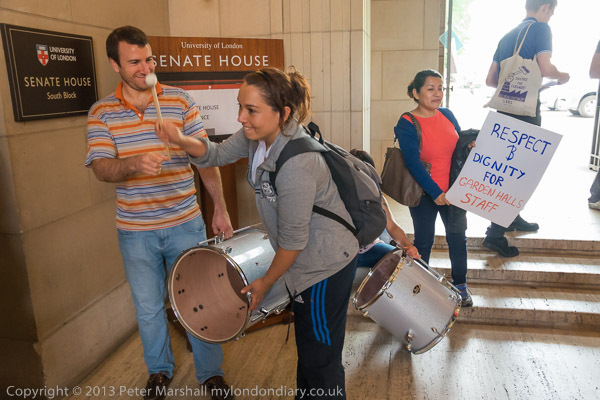 In the top image on this post I carefully places the University’s Senate House board at the left of the frame and the ‘Respect and Dignity for Garden Halls Staff’ at the right of the image. For the lower image I used the 16mm full-frame fisheye. It is sharp and gives plenty of depth of field at f4 and is a good lens to work in the fairly confined space. To get a reasonable shutter speed – these are pretty active protests – I had to set ISO 2500 which allowed me to use 1/100th second. The closest figure, holding the large placard is just slightly soft as I focussed (a slight mistake) on the central figure, but fortunately she and the placard she is holding are sharp enough. Sometimes a little use of the adjustment brush with a positive value of Clarity, typically +20, can help in cases like this, though I didn’t use it on this image. I feel, though I’m not quite sure, that the slight foreground unsharpness helps to give the picture a little more depth. The Fisheye-Hemi plugin straightens out the verticals – in the original above, the doorway was noticeably curved, and the figure at right rather distorted. Later the protesters walked around the outside of the building and then went into Stewart House, another university building which is actually connected to the Senate House. Once inside they didn’t really now what to do or where to go, and it was hard to take good pictures in the often fairly narrow corridors. And when I did so, too often I was on the wrong site of a flag – with the text visible but back to front. Fortunately, as you can see in Garden Halls Closure Senate House Protest I did manage to get on the right side for some more pictures, but it is very easy to miss things like this in the heat of the moment – and only see them when you load the images onto computer for editing. And it really was fine weather, warm and sunny but not too hot, and I was in a good mood, though just a littel disappointed when I arrived outside The Spectator offices where the protest was due to start dead on time to find nobody there. It’s not unusual for me to turn up at protests and find they don’t happen, but today I was fairly certain that this one would take place, if just a little late. Rather than waiting on the street outside the offices I decided to head towards the nearest pub, where I arrived to find a small group of the protesters standing outside (the Romany flag was a giveaway), just about to leave for the protest. Rather than drink on my own – something I seldom do – I went with them. It was really good lighting, sun from the side, and the light walls of the offices around giving some natural fill so I didn’t need to use flash. The protesters were from the Traveller Movement, here to protest against the magazine’s publication of an article by Rod Little supporting the use of racist terms – the ‘g’ and ‘p’ words – to describe travellers, Roma and gypsies – more about this in Travellers protest Spectator’s racist language in My London Diary. 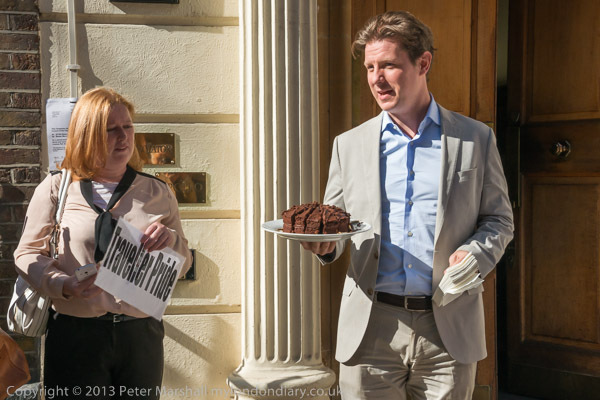 After the protesters had stood outside the offices for around a quarter of an hour, Spectator editor Fraser Nelson came out to greet them carrying a plate of chocolate cake and some serviettes. It was, he told them his birthday, and they had far more cake inside the office than they could eat, so would they like some. Although most of the protesters decided they didn’t want to eat his cake, I had no such problems, and told him it was my own birthday too, though I was a little older as I took a large slice. It was delicious, and came as an unexpected bonus. I can’t recall ever having been at a protest before where the person being protested against has offered cake. Not of course that cake makes his actions as an editor any more excusable. It is language that no reputable journalist would entertain, and certainly against the clear guidelines of my union, the NUJ, on the fair and accurate reporting of race relations subjects. Soon after the protesters rang on the doorbell and went inside to deliver their letter of protest, and shortly after I left to catch a bus to the Ukranian embassy in Notting Hill. It was the evening rush hour, so the journey was slow, very slow. There are quite a lot of ‘bus lanes’ but these have a tendency to give out where they are most needed, and to be clogged by taxis elsewhere. Fortunately I was in no great hurry, and the top deck of a London bus is a good place from which to view the city, and just occasionally to take photographs from, though I don’t think I did so. Or at least, as so often, none that were worth keeping. As I had anticipated, things were hardly starting by the time I arrived at the Ukrainian Embassy in the very posh backstreet of Holland Park. 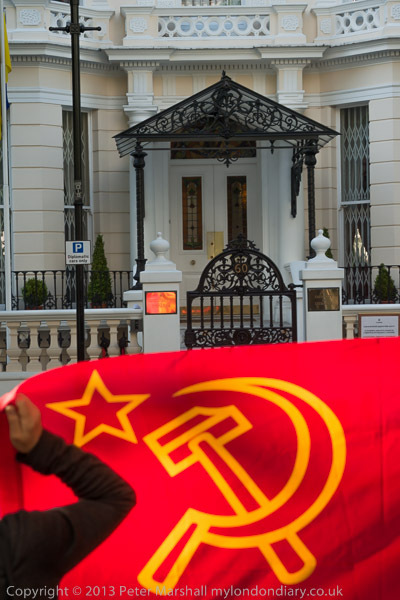 Although a Communist newspaper described the event the following day as a ‘siege‘, the protesters were actually standing rather peacefully on the opposite side of the road, making it difficult to really connect them with the embassy visually. It didn’t help either that the embassy’s blue and yellow flag was hanging limply in a thin line down its post. After a few minutes, some of the protesters got out their banners, and I noticed that from a particular position one was reflected in the brass plate on the embassy gate. Having taken it from the other side of the road I tried to go closer to the gate and work with the reflection, but couldn’t get it work as I wanted – and while I was trying, a police car came and parked in the way, bringing the number of diplomatic officers present to two. 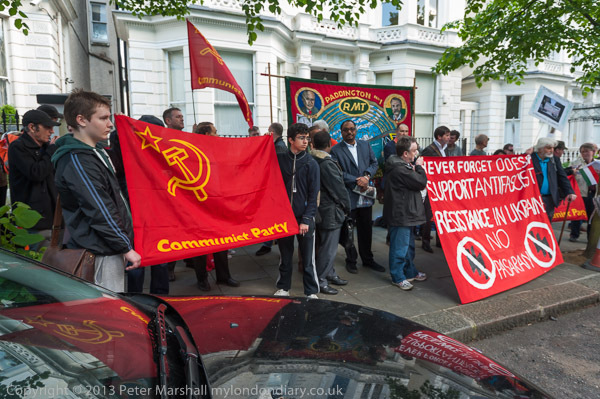 The protest had united various communist groups which generally have little in common other than their opposition to US imperialism, which they saw as behind a fascist coup in the Ukraine. 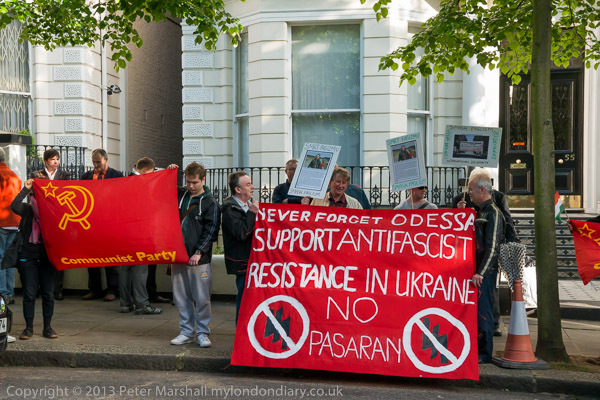 The incident which sparked the protest was an attack on a protest camp and Trade Unions House in Odessa on May 2, when 42 people were killed and over 200 injured by Ukrainian neo-Nazis. They see the current government in Ukraine as openly fascist and anti-democratic and call it a ‘Neo-Nazi junta‘, though this led to a problem with the chanting of slogans, with some factions supporting the Spanish pronunciation and others the fully anglicized version of junta, and argument that got just a little heated. 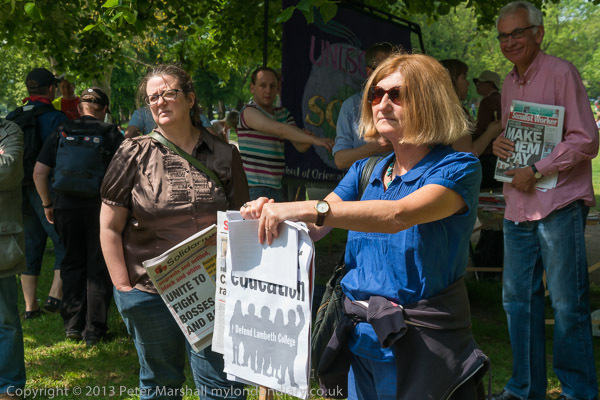 Some too were unhappy at being photographed by the capitalist press – that is me, who regularly gets labelled as a ‘dirty commie’ by the right wing because of my membership of the NUJ. Of course I took the usual pictures of people with banners and placards. I played a little with putting the hammer and sickle in the corner of too many of them, but I wasn’t really too pleased with the images and wanted something a little more striking. Eventually I think I found it, with the protest and its reflectioin in the windscreen and black bonnet of a parked car. I made a couple of frames and then moved away. It took a little care in printing to get the effect I had seen, but I rather like it. I walked back along Holland Park towards the centre of London rather than to the closer bus stop I had come to, because I thought I would pay a visit to St Volodmyr, the patron saint of Ukraine and the king who converted the country to Christianity by decree a little over a thousand years ago. 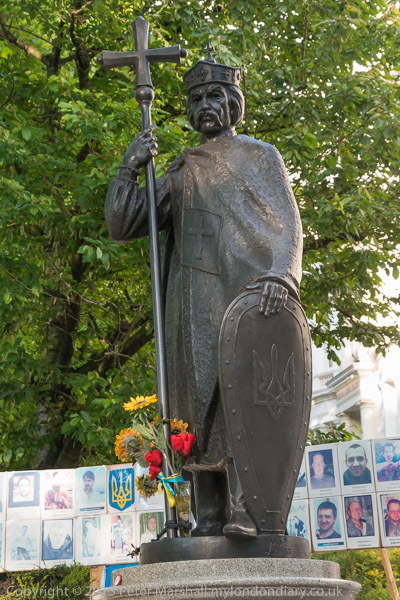 Around him now are flowers and photographs of the martyrs of the Maidan; some of them may have been fascists, but most were nationalists who wanted freedom in their country. It was getting just a little dark, and I photographed the dark metal figure both with and without flash – as you can see in Communists & Anti-Fa protest Ukraine Massacres. The exposure above without flash has more interesting lighting and gives more detail in the statue. Flash on camera flattens the statue too much, though renders the flowers around the base of the statue in a wider view well. It was time to go home, and to eat some of my own birthday cake after I’d blown out the candles. On Tuesday evening I went to the opening of Isle Of Dogs Then & Now: Photographs By Mike Seaborne, which is showing at George Green’s School Café Vert, a venue for various community and youth organisations, open to the public at times. But it is rather easier for most to see Mike’s work elsewhere, particularly in the ‘Then and Now‘ section of Mike’s 80sIslandPhotos web site. In the show his black and white images from 1983-6 were paired with colour images taken from the same place over the past year or so. For some it was easy to know exactly where he had taken the earlier photograph – the belfry was still there, and the chimney of the former colour works has been retained, although it is the only thing in the recent photograph that remains – even the river walls have been rebuilt since then. 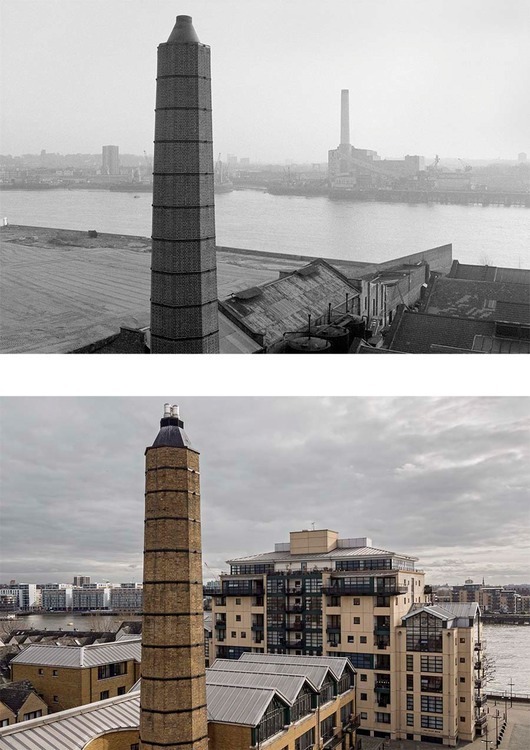 The power station across the river on Deptford Creek is long gone – and you can see the chimney in mid-air as it was dynamited in one of Mike’s pictures. Mike’s photographs of the area form an important record, not just because of the quality of the work but also because of the information that is attached to them, both by him and also by others, and part of the reason for making them available on-line is to enable others to come forward with more information about the people and places in them. You can also see more of Mike’s work from this and other places on his main web site, and also on the Urban Landscapes website that we set up around 12 years ago and co-curate. Although I took quite a few pictures on the Isle of Dogs around the same time as Mike in the 1980s – some of which are in my book City to Blackwall 1977-84 (preview here) – my work there just a small part of a much larger project on post-industrial London and not dedicated to a particular area. His is a much more in-depth study than mine and one that involved considerable interaction with the local community. It was only a few years later that I got to know him, when I joined a group of photographers he set up, London Documentary Photographers, to document the changing city, though by then I had seen some of his work – both of us had four pictures in the 1988 BJP Annual, two of his from the Isle of Dogs. At the opening I talked briefly with Mike about the problems of re-photographic projects such as his, particularly in areas like the Isle of Dogs which have undergone almost complete redevelopment. I’d had a few hours spare and had walked through the Island on my way to the show, taking a few panoramas. Much of the way I was walking along streets and paths I’d walked on back in the 1980s, and little remained. I think I would find it tricky to exactly pinpoint the locations of many of the pictures I made back then, or the exact direction in which my camera was pointing. Later I began to take more careful notes about locations, and as well as street names the contact sheets from much of my later work also contain grid references, although these only locate to a 100 meter square. Life would be much easier now with GPS and the ability to automatically record the image location into metadata. I’ve never believed the story about Robert Capa‘s D-Day films being ruined by a darkroom technician, but though I’ve certainly expressed my doubts in discussions I can’t find anywhere where I’ve published them clearly in print or on the web. I don’t believe it because I’ve tried hard to melt film, and it isn’t easy, and when you do so the results don’t look anything like those familiar D-Day images. Back when I was teaching art students, some of them worked hard to distress films in various ways, and found modern emulsions surprisingly resilient. They couldn’t get results like Capa’s using a film dryer or a hair dryer on full heat and ended up using more extreme means – ovens, matches and gas burners – and the results were rather different. Both Capa and Rodger covered the D-Day landing in Normandy. Rodger strode ashore at Arromanche and found little happening, while Capa hit Omaha Beach where all hell was breaking loose. He shot three rolls of film on his two Contaxes, during the approach and wading ashore from the landing craft and then while lying flat on the wet sand while bullets raced over his head. Capa’s most quoted remark about photography is ‘If your pictures aren’t good enough, you aren’t close enough’, but here he was closer than he intended. He realised his duty as a photographer was to get the pictures back and rushed himself and his film back on to a landing craft and from there to England. Only 8 of the 106 frames were fit for use. Apparently the Life darkroom technician was so excited by what he saw that he allowed the film to overheat while drying it, ruining most of the film. Life at first put out a story that the pictures had been ruined by sea water, then, after telling Capa what had really happened, ran the pictures with a caption that enraged Capa, saying he had not focused properly in the heat of the action. Of course this and a certain amount of camera shake would have been pretty excusable in the circumstances. The faults that are present in the existing pictures give them a graphic quality which would have been lacking in properly processed work. What I was implying in the section emphasized above, though being careful not to be explicit, was that to me these pictures looked just as if they were out of focus and suffering from camera shake and that we needed no other explanation for what we can see. But while I only implied and failed to research in any detail, J Ross Baughman recently made his views quite clear in two guest posts on Photocritic International, Robert Capa’s Troubles on Omaha Beach (1) and (2). Coleman’s account is not quite as clear as it might be in part 4, as his mind has been changed by an exchange with photographer Mike Doukas. The frames shown on the contact sheet appear to be the final ten from a commercially loaded 36 exposure cassette, ending as usual at frame 38 (with 37 the missing negative.) They start with 5 exposures made from the landing craft as troops wade ashore and end with the final picture Capa took on the beach. The other films lost or ruined appear not to have been taken on Omaha beach but – according to Capa’s own notes, to have been taken earlier during boarding and the journey across the channel. It is hard to know what to make of Capa’s claims – discussed by Coleman in part 5 – to have taken more films (or indeed about anything else in his life – Capa was nothing if not a great story teller, and good stories are always at least a little more than the truth), but Coleman’s dismissal of this seems convincing. But he is surely too harsh on Capa in the conclusion that by only taking 11 pictures and then running to get away from the beach that “On this crucial occasion, the opportunity of a lifetime, he failed himself, his picture editor, his publisher, his public, and history itself.” It is perhaps a conclusion that reflects Coleman’s own anger at having been taken in for so long by the improbable story. It was arguably a surprising failure not to have reloaded the camera immediately before the craft hit the beach so as to have a full 36 exposures at his disposal, but perhaps there was not enough warning that it was about to happen. But flat on the beach under withering fire he would have known that he only had a few frames left, and probably felt that loading another film would have been too much of a risk to his life. To get a couple of good images, pictures that became icons for whatever reason – and to keep alive to take them back to England seems to me a success. You need to read the whole story, starting with Robert Capa on D-Day which Coleman published on June 10th. One mystery I think remains. The young lad in the darkroom was long thought to have been the 18 year old Larry Burrows, but later LIFE‘s London picture editor John Morris who was in charge later made clear that he had not been involved, laying blame on the youngest of the darkroom staff, 15-year-old lab assistant Dennis Banks (although according to Capa biographer Richard Whelan, his name was Dennis Sanders.) 15 in 1944, if still alive he would be 85 now, and in any case there must still be many people alive who would have known him, and doubtless he would have told some his story. If he – or anyone who knew him – is reading this we would all like to hear from you, so please get in touch. Or was he simply a fictional character? I’ve finally worked out how to get TIME Lightbox to almost work on my computer, running the latest Firefox. It has always been a frustrating experience before and the only way I’d found to see all the pictures was to manually alter the address line in the browser. But now I’ve realised you can actually go on to the next image by simply waiting for the black rectangle to appear along with the ‘timer thingy’ and then pressing the ‘F5’ key to reload. It still isn’t perfect in that to see the pictures in the full window (they call it full screen) you have to do it individually for each image, as the reload reverts to normal view. Or perhaps that is how it’s supposed to work? I suspect my problems come from my computer refusing to accept some advertising or tracking stuff TIME want to load on me. I do have a few things set up like ‘DoNOTTrackMe‘ which blocks four trackers on the page. Although I post a lot of material on the web I value my privacy and can’t really understand people who use Facebook but don’t look at their privacy settings. And I use and would recommend FB Purity and the advice in How to stop Facebook snooping on your web browsing activity and other similar articles. Actually it is best to look at the work on the photographers’ own site, where there is also some text about the project. The pictures were made in 2012-3. Back to Rochester, long the home of the yellow box which fed so many cameras, and as well as Kodak, also Bausch and Lomb and Xerox. Kodak no longer make film, and some of the pictures by Alex Webb here were shot on the last few rolls of the Kodachrome that was so symbiotic to his photographic style. But now the film can only be processed – with slightly unusual ‘distressed’ results as black and white. There are also some typically bold colour images by Alex (which I presume were made on digital), to my taste rather stronger than the more poetic pictures by his wife, Rebecca Norris Webb, still working with (no longer Kodak) film. The book is published by Radius Books who advise “As both previous RADIUS books with these artists have sold out quickly – this is sure to be a collector’s item.” I could ask why if they think this to be the case they did not produce a larger print run. But then perhaps they did! As well as the standard edition, signed copies are available for an extra $5, as well as a limited edition with a couple of signed digital C-types thrown in for an extra $1440. I’m not greatly attracted by signed books – though I do have a few, mainly from having attended book launches or having bought directly from the photographer. But though I’d never pay a great deal more for a signed copy, I think the idea of marketing them at a small premium – so long as most or all of it goes to the photographers – is a good one. Although given the deliberately small print runs of many new photographic books, there really is little reason why every copy should not be a signed copy. Rochester of course still has a special place in photography, George Eastman House, the world’s oldest museum dedicated to photography which opened in 1949. It was also one of the first institutions to put a large collection of its photographic works on-line in 1998, and although the original site was decommissioned in 2006 it remains available for ‘historic and research purposes’. The replacement site is perhaps easier to search, and quite a lot of the older work is on Flickr. 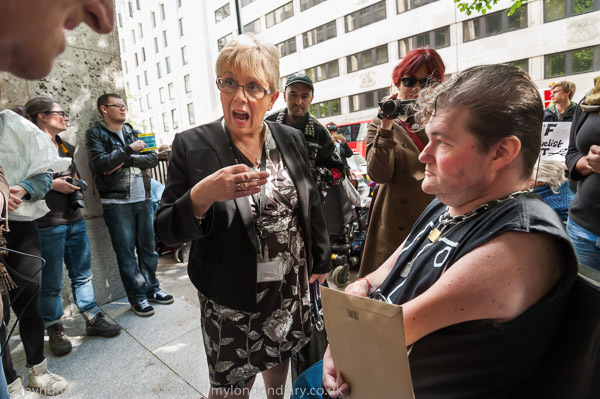 I was on my knees in the doorway – locked and guarded by security – of the Department of Work and Pensions, where protesters from disablement activists group DPAC had brought a letter for the Minister for Disabled People, Mike Penning. There wasn’t a great deal of room, even though I was the only photographer in front of the protesters, and I was using the 16-35mm, so was very close to the guy holding the envelope. Even at the time I was wishing they had written his name rather more clearly on the envelope, though I’ve brought it out a little in post-processing. The lighting was tricky, with a little bright sunlight leaking into the scene in various areas, but all the significant subject matter in shade. Those near-white buildings opposite were very bright – and have been brought down quite a bit in Lightroom, where I’ve also brought up the shadows considerably. As taken the envelope was reflecting quite a lot of light and looked rather lighter than a manilla envelope should. But Nikon’s pattern metering worked well, though I doubt if this picture would have worked if I had not been using RAW. Although I was only working at f5.6 (1/125, ISO 640) at 17mm there was considerable depth of field and the figures in the foreground – with the slight exception of the moving tiger – are pin sharp. Those at the back and the background are a little soft, just enough to add a little depth to the image, and the slowish shutter speed adds just a slight blur to those moving, particularly one hand of the figure holding the poster ‘Stop Killing Us’. I’ve not bothered to correct the slight barrel distortion at 17mm, because I think it actually – if fairly subliminally – improves the image. You can see it in the lines of the background building and I think it has a slight effect of keeping the eye drawn in to the centre. It is actually more than you think – that tiger’s heel at bottom left just touches the edge of the frame after correction. Of course I didn’t have time to think about everything when I was making the image – things were changing quite rapidly as usual, but I was certainly very conscious of the framing – and the images before and after this and its partner were both made at 16mm and from slightly different positions. This was the sixth of three seven frames where I was concentrating on the letter (the next differs only in having the tiger stationary a foot or so to the right), and after it I moved to the left as I wanted a clearer view of the placard with the scissors and the message ‘ILF Cruelist Cut’. But this picture stood out. The next frame was good too, and appealed to me because the tiger holds in his left hand a grey bag with my name, MARSHALL, clearly visible – making this a pre-signed image. But it seemed just a little static compared to the above. Perhaps I should get one of those bags and take it to all protests! This was another picture I liked, and I had to look at the original RAW file to confirm that this was exactly how I framed it when making the picture. It’s another good example of why I like working close with the wide-angle – in this picture at 21mm. Here I had more time to work and took around 20 frames – this has the best framing and fortunately the best expression on the speaker’s face too. And it shows up those tattoos well. Of course I don’t always get what I want, but at this protest I made a number of images I was pleased with. 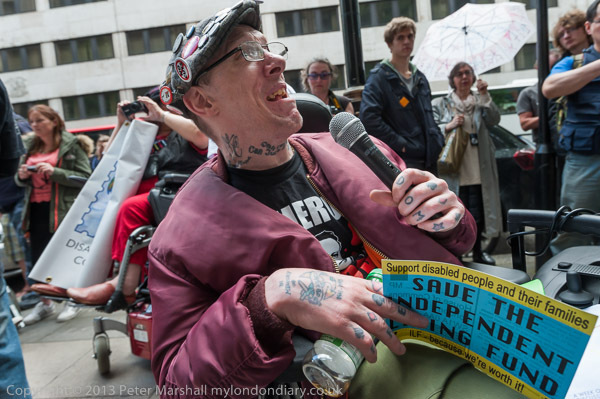 Although it was quite crowded on the pavement – and wheelchairs take up quite a lot of space, there were not very many other photographers present – and those present cooperated with each other. 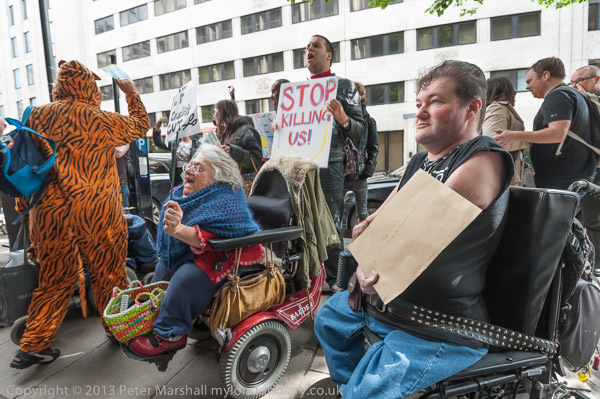 The DPAC protesters are always nice people to work with and of course they have great reason to protest, with disabled people having suffered the most from the government’s cuts. You can read more about their protest at Save Independent Living Fund where there are also quite a few more of my pictures from the event. Back before the Thatcher era the idea of private companies making profits out of supplying gas seemed ridiculous. It was an industry with a single network of pipes across the country. 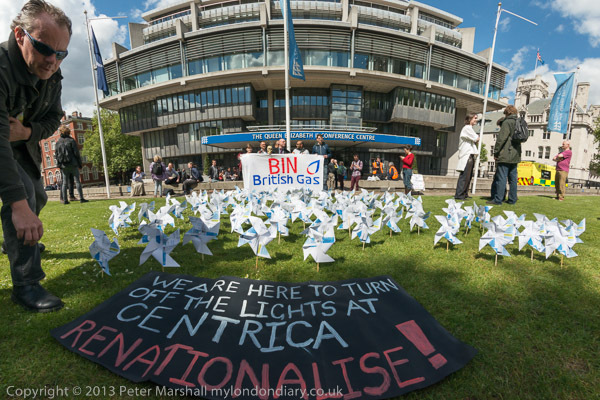 Of course in the distant past we had over a thousand gas companies, each with its own area, some private and some municipal, all merged into the nationalised area ‘gas boards’ under Clement Atlee in the Gas Act 1948, and into the single British Gas in 1972. It was an industry where nationalisation made sense, and I think delivered a better deal than the privatised British Gas created by the Thatcher government in 1986. For the next 10 years, domestic users had no choice of supplier, and it was only in 1998 that the market was fully open to competition. It’s hard to see any real benefit for the consumer that privatisation has brought, and after recent price hikes few still believe there was any financial advantage – except to the shareholders of the privatised British Gas and other big energy companies and those who bought shares cheap and sold quickly at a large gain. In the days of the gas boards things were simple. Anything to do with gas and you knew where to go. There was a ‘gas showroom’ in every town of any size where you could go and look at new gas appliances, and to pay your bill, and if you smelt a leak or needed maintenance or anything else, the board (and from 1972-86 British Gas) was the place to go. Things were simple and they worked pretty well. Much the same was true of electricity, again nationalised by the Atlee government – by the 1947 Electricity Act, and privatised in 1990. Most people would prefer a simple national system for energy in the UK again, with a YouGov poll in November 2013 showing over two thirds of people backing the energy companies being brought back into the public sector and only 21% saying they should be private. Even among Conservative party voters over half – 52% – thought they should be re-nationalised. It is a pretty clear indictment of the current system, so it is perhaps surprising that none of the major political parties seems to be even considering renationalisation. I think it says something about how our democracy works -or rather fails, protecting some private interests rather than the public good. Few of us can be bothered to change our energy suppliers to get a better deal – and many who have done so have found themselves actually paying more with an incredible level of misleading selling. In the 18 years it has been possible to switch suppliers I’ve only done so twice; once to get the small benefit of a ‘dual fuel discount’ from buying gas and electricity from the same supplier, and more recently for ecological reasons to a green energy company, Ecotricity, which has no shareholders but uses all its profits to develop new renewable energy services. As a bonus, it also seems to be saving me a little money. 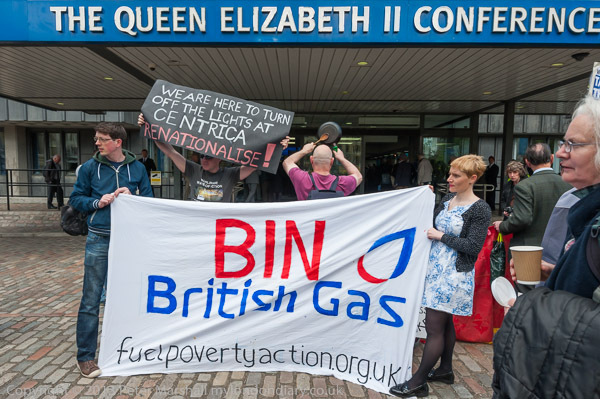 So I was very much in sympathy with the protesters outside the AGM of Centrica, the parent company of British Gas, a protest organised by Fuel Poverty Action, with their slogan ‘Bin British Gas’. 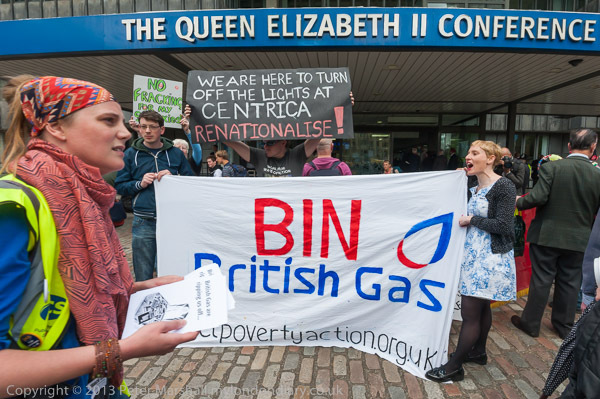 You can read more about their aims and the protest, along with many more pictures in Bin British Gas on My London Diary. Another picture taken with the same lens, the Nikon 16-35mm f4 from more or less exactly the same position, but at a slightly wider focal length has a big difference. The name of the conference centre is straight on the upper image (at 22mm) but rather definitely curved in the lower 16mm version. There is more distortion at the wider focal length, but the real reason for the difference in these pictures is that I have used the lens profile in Lightroom to correct the 22mm version. I could have done so for the lower image but chose not to. I have changed my default setting for the profile in Lightroom to use 0% distortion correction, because for most subjects the distortion actually gives a slightly less distorted looking effect at the edges of the pictures, avoiding a little of the problems of rectilinear correction on extreme wide angles. It also gives a slightly wider field of view, with any correction of distortion always resulting in a little loss at the edges. The distortion is only generally a problem with architectural subjects and other things with obvious straight lines – as in this case. But correcting it would have lost more than I was willing to lose of the hair of the woman at the left of the image. 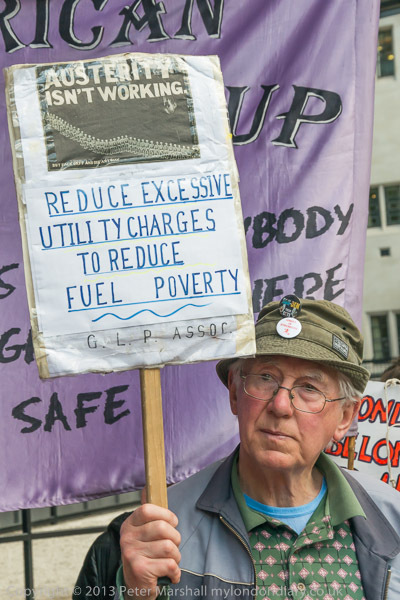 Pensioners are among those hardest hit by high fuel prices – many now find themselves having to chose between keeping warm or eating. 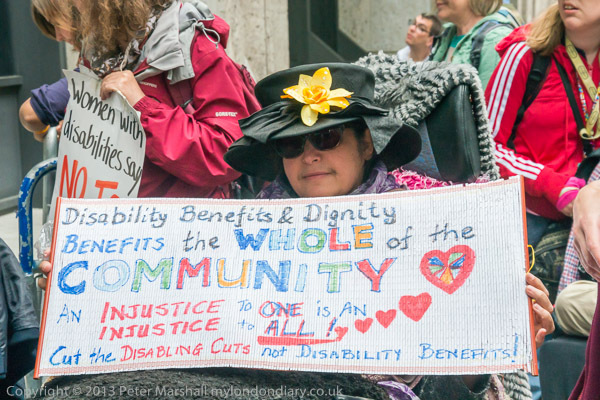 I took several pictures of one of them holding a hand-made placard. I think this was the best, though probably it would be improved by a little crop at top and right, but you can see another version on My London Diary. Obviously the face and placard were both important, but less obviously I think his hand gripping the placard adds to the picture. As (almost) always the images are un-posed. 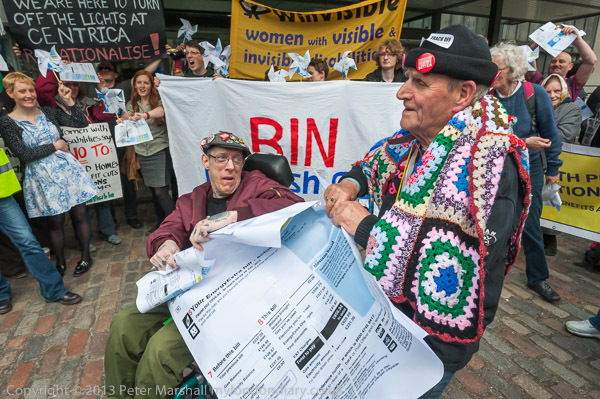 I rather like the picture of a giant gas bill being torn up, though it proved a little difficult for them to tear. I was surrounded by other photographers when taking this and the other pictures and unable to move much, but I’d chosen a fairly good position – thinking in advance what was likely to happen and where and getting there before the others. They did eventually tear it to pieces and then Terry who was right next to me threw them into the air. It was a picture with no second chances and I would have liked more of the pieces to have been the other way round – ideally to show the British Gas logo. But you have to take what you can. Along with the other photographers present (and we did get in each other’s way a little) I had a few minutes to think about how to take this, and to try different ideas, with focal lengths from 16mm fisheye to 70-300mm telephoto. There are four different views at Bin British Gas but this is my favourite. Photographers say that they are targeted by police because their pictures show the reality that the Bahrain government wants to hide, and are subjected to mistreatment when arrested. Ahmed al-Fardan was arrested in the early hours of December 26, 2013 and his cameras, hard drives and flash drives taken. He was blindfolded, handcuffed a kept in a freezing cell for interrogations – and comes to trial on September 14th. al-Farden like me submits work to Demotix, and it is distributed by Corbis. Among the events he has covered was a Demonstration in support of arrested photographers in Bahrain on 25 October 2013. An earlier group of pictures, Political Participation and Toxic Gas won him first prize in Freedom House’s 2013 Images of Repression and Freedom. 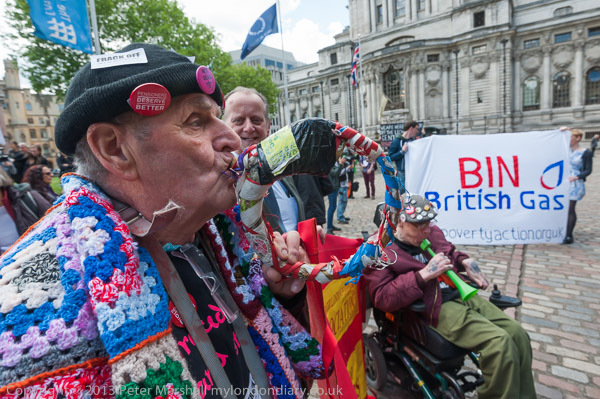 You can see many of his pictures from protests on Demotix. Although I’ve occasionally been pushed, hit and threatened by police covering protests in London, the situation is clearly very different here and usually at least our authorities are much more subtle. Photographers may sometimes be taken to court to get them to produce their pictures as evidence, and I have friends who have got settlements after being assaulted by police, but we simply don’t face the same problems here as in Bahrain. Protesters here don’t get shot by police, though occasionally a criminal suspect or innocent person has been, as well as some people detained in police stations. We can all remember cases like that of newspaper seller Ian Tomlinson who died after being assaulted by a police officer at a protest – or Alfie Meadows, very nearly killed and prosecuted for assaulting a a police officer, but these are exceptional. The UK establishment mainly simply ignores protests. I’m writing this on the day after a protest on the streets of London by anywhere from 15-50,000 people. It started outside the BBC so they could not miss it, but they only reported it – in a short and vague fashion – after many, many protests to them by phone, e-mail and tweets. To get the story in any detail meant going to foreign-based news channels or left-leaning news sheets. Even Demotix, although it publishes the pictures, no longer publishes the stories that go with them. You are currently browsing the Re-photo blog archives for June, 2014.